Massive fraud, crony capitalism and a pollution disaster right on the Great Barrier Reef coast. It's business as usual for the world's dodgiest mining giant. 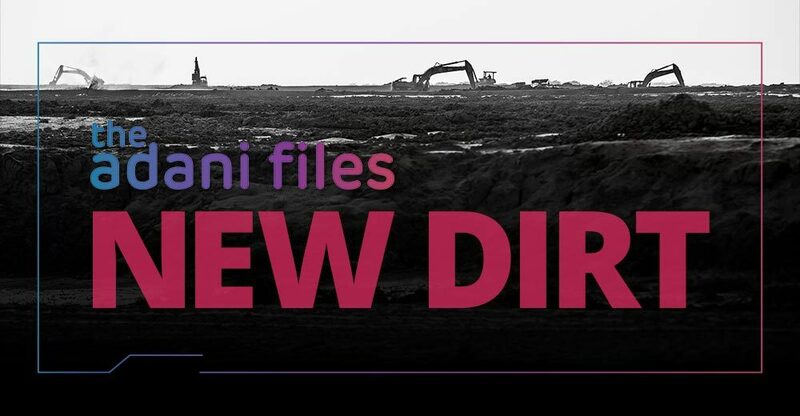 In February 2017, GetUp released The Adani Files — a summary of Adani's track record, based on research into hundreds of court documents by Environmental Justice Australia and Earthjustice. It exposed environmental destruction, corruption and criminal activity on a grand scale. But in just six months, Adani have racked up so many fresh scandals and disasters that we've had to update their rap sheet. The latest Adani Files reveal that Adani have already brought their shonky business practices and environmental destruction to Australia. It proves beyond a doubt that Adani can't be trusted to build the world's biggest new coal mine. And they definitely can't be trusted with a billion taxpayer dollars to do it. Adani is accused of a complex $298 million fraud that cheated shareholders, tax authorities and Indian energy consumers. An explosive Guardian investigation revealed details of how Adani allegedly siphoned hundreds of millions of dollars borrowed money into offshore tax havens. Legal documents detail how Adani set up a front company in Dubai to order equipment from, before selling it back to themselves at massively inflated prices. They then used a complex money trail to hide the profits in a tax haven. A significant amount of the money Adani allegedly siphoned was provided by Indian taxpayers. The over-pricing of equipment used to supply electricity would have also led to increased power prices for Indian consumers. As we speak, the Turnbull government is deciding whether to hand over $1 billion of the Australian taxpayer funds to Adani through the Northern Australia Infrastructure Facility (NAIF). The loan is integral to the Carmichael Mine succeeding. NAIF has been strongly criticised by governance experts for lacking transparency and accountability. And the NAIF board is riddled with conflicts of interest. Over half of the NAIF board members have close ties to the mining industry. At least one is facing allegations that they could directly benefit from Adani's mine going ahead. Given the serious concerns around governance of the NAIF, and Adani's ongoing investigation for massive taxpayer fraud, the Turnbull government should immediately rule out any taxpayer funding for Adani. Watch this video to find out more about NAIF. Adani continues to show contempt for communities in India. Courts are investigating how Adani managed to cut a deal to reap all the revenue from a new sea port at Vizhinjam for up to 60 years, even though the state government of Kerala put up most of the money to build it. It's alleged Adani could pull in an extra Rs 61,095 crore ($12 billion AUD) from the special arrangements - while the state of Kerala gets nothing. In addition, Adani can charge fisherman to use the facilities in the fishing harbour, which are being built with state government funds. A former High Court judge is now investigating how Adani managed to cut such a sweet deal with the Kerala government. Adani unfairly profiting from special deals at the expense of local communities is already a problem for Australia. Adani have been given special treatment from Australian governments on multiple occasions. The Queensland Labor government recently introduced stricter water laws but made one company exempt — Adani. They gave Adani free and unlimited access to Queensland's groundwater. The Queensland government have also been negotiating a 'royalty holiday' deal with Adani, whereby Adani will pay reduced royalties to the state of Queensland for the coal they export to India. This deal was still being negotiated after an Adani lobbyist had started working on Queensland Premier Palaszczuk's election campaign -- a blatant conflict of interest. Adani's special royalty deal could result in $320 million worth of lost revenue for the state of Queensland. Adani's tendrils into Australian politics run deep. Adani has hired former political staffers from both major parties to lobby for the Carmichael mine. When Prime Minister Turnbull visited Adani CEO Gautam Adani in April 2017 he promised him he would 'fix' Australian Native Title law to override the rights of the Wangan and Jagalingou Traditional Owners and ease the passage of Adani's mine. The Native Title legislation was changed in Adani's favour in June. The willingness of state and federal governments to make Adani exempt from rules, and change laws to their benefit, is a serious concern for our democracy. In March 2017, Adani massively breached their licence at the Abbot Point coal terminal by releasing coal-laden water into the ocean. Just before Cyclone Debbie hit Queensland, Adani scrambled for a special licence allowing them to pollute well above normal limits during severe weather. Yet, even with a special licence to pollute, it was revealed that Adani discharged wastewater that exceeded their pollution licence by 800%. For this significant breach, Adani was fined a meagre $12,900, but they are still challenging the fine in court. Horrific aerial images after Cyclone Debbie also show the adjacent Caley Valley wetlands turned black by contamination of coal dust. A scientific assessment of the impact on the wetlands was not conducted until a month later, but coal was still present throughout the wetlands, and at concentrations of 10% at the point where Adani released the coal-laden floodwater. Adani have operated with callous disregard for the environment and local communities in India. The pollution disaster at Abbot Point shows they are already bringing their destructive environmental practices to Australia. Right on the doorstep of the Great Barrier Reef. The paltry fine Adani received from the Queensland Government won't deter Adani from breaking environmental regulations in the future. And Adani's decision to challenge the meagre fine demonstrates their contempt for Australia's environmental laws. 3 workers were crushed to death when a coal heap caved in at Adani's Dhamra port in August 2017. Unfortunately this tragedy is not an isolated incident. There have been numerous reports of injuries, deaths and exploitation at Adani work sites which demonstrate Adani doesn't take sufficient precautions to ensure the safety of its workers. Leaked emails reveal Adani has been in talks to do a weapons deal with South Africa's Gupta family. The Guptas are bad news. The establishment British PR firm Bell Pottinger recently collapsed after it was revealed during the same leak it was involved in a Gupta family campaign which intentionally stoked racial tensions in South Africa. Adani's lawyers demanded that a veteran Indian journalist - Paranjoy Guha Thakurta - remove articles he published suggesting Adani had unduly benefited from its close relationship with Indian Prime Minister Narendra Modi. Mr Thakurta's articles raised evidence that the Modi government had changed laws to benefit Adani. And questioned why the Government had given Adani a refund of almost $98M for customs duties that had never been paid. Mr Thakurta's subsequent resignation has led to accusations that Adani has used his wealth and political clout to intimidate Mr Thakurta into staying silent. Adani unduly benefiting from close ties to Indian politicians should raise concerns in Australia. The mining giant has spent tens of thousands of dollars on political donations and wining and dining Australian politicians both in India and Australia. Ex-staff from both major parties have gone on to work for Adani, and an Adani lobbyist is currently working on Queensland Premier Palasczcuk's election campaign. The revolving door between Adani and Australian governments raises questions about whether politicians are making decisions in the public's interest, or in Adani's interest. Can you share the latest Adani Files and call on the Government to immediately rule out any taxpayer funding for Adani? Tell your friends and family why Adani cannot be trusted to build the world's biggest new coal mine.